We'd originally planned this tour for a few weeks ago, but a family emergency prevented us from doing it. The forecast for the weekend was dodgy, but since there was a chance that we could do the tour, so off we went. Saturday we took an early train from Basel (the forecast is for the weather to get worse in the afternoon and we want to avoid as much of that as possible) and headed to Kandersteg. After a (very) quick stop at the kiosk to get greg a pair of sunglasses (stupid thing to forget!) we took the bus to the gondola station at Eggeschwand, where the walking starts. The first bit is on a really nice path up through a gorge; the Kander has a lot of water in it so this is quite dramatic. The gorge opens onto the plain of the Gasteretal, which we walk through, enjoying the views and the shade (it's hot!) and gently climbing until around Selden, where the trail turns uphill. We take a quick snack and water break in the shade and then start the climbing. It's hot, the packs are heavy, and there isn't all that much shade, so this isn't the most enjoyable bit of hiking we've ever done. Still the views are quite nice. We stop for a lunch break at Schönbüel and then continue our way up, up, up. Eventually some clouds move in and a breeze picks up, which really helps with the temperature. At around 2400 we cross the last sad traces of the Lötschegletscher; the route is marked with poles and most of the glacier is covered with rocks anyway, so this is still all a red-white trail. The moraine leads us to a rock face that the trail nicely threads through before mostly flattening out for the last bit to the Lötschepass and the hut. We're at the hut pretty early, so we have plenty of time to hang out and enjoy the views and madness (there's plenty of it!) and take a quick nap before dinner. True to the forecast, there is some real rain in the late afternoon (no lightning though). After a very good meal (two huts in a row with really good food!) we do some trip planning and then head off to bed, crossing our fingers that the weather will play along in the morning. We're up shortly before 5am in order to do breakfast at 5. The weather isn't particularly promising: it's just rained some and it continues to lightly sprinkle. We keep our options open and enjoy a leisurely breakfast. After eating we can't postpone the decision any more: the forecast is still dodgy and the weather radar doesn't look great (nice to have good reception at the hut). The route to the Ferdenrothorn is a mix of scrambling and easy climbing along a ridge where the rock is loose and there's really no chance to abort the tour early. We really want to go, but in the end decide that the weather situation is just too marginal to do it. Crap. Since it's not currently horrible outside, we decide to go ahead and head down. Down, down, we go along another nice trail that takes us to the Kummenalp and then further down, down, down to Ferden. We get there 10 minutes after the bus has departed and rather than hanging around we decide to walk the rest of the way to Goppenstein. This is a great hiking path through the woods. It's nice to have the cover, because along the way it starts to really rain. We congratulate ourselves a bit on having made the right decision to cancel the tour (we'd still be on the ridge) and head on to Goppenstein, where we catch the 9:00 train back towards Basel. An aside about that train: it's full of Italians who seem to be doing a day trip on the train through the Swiss alps. We don't normally take trains at this time of day, so this is a new one to us. 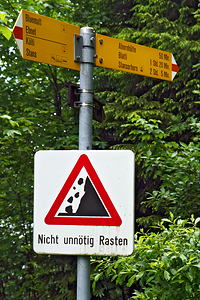 We'll have head back to the Lötschepasshütte and actually do the Ferdenrothorn tour. The hut is great and the views from the peak must really be something.